Wondering what it takes to build and host your own wiki? Perhaps you want to run your own custom-themed encyclopedia, or host living documentation for your organization. Whatever your specific case is, the following tips and guidelines will help you identify the best tools and vendors for building and hosting your wiki. A wiki is a collection of pages — or an entire website — dedicated to modifiable content that is contributed and maintained by a community. This group could be an assortment of Web users united by a common interest, a department, or a recreation/social group. Perhaps the most prominent example of a wiki is Wikipedia.org, the Web's preeminent, wiki-driven encyclopedia, maintained by a legion of volunteer contributors. Wikia.com is another site that allows you to create a wiki for any theme or use case, providing wiki functionality as a service. Wikispaces is a wiki provider that targets the education sector, allowing teachers and students to collaborate with wiki-based tools. You'll want to take a look at existing wikis and wiki website buildersto get a general sense of how your own wiki will look and feel. For those looking to be website builders, wiki services like the ones previously mentioned are fine for general use. But you may require more control, or perhaps you need to scale your wiki to support a large volume of users. In these cases, building and hosting your own wiki is the best option. By having control of both the wiki software and hosting account it's running on, you're free to build a more customized experience using any wiki software of your choice. The first step to making your own wiki is to select an appropriate wiki package, which invariably comes down to the OS. This is an important decision, as it ultimately influences which hosting provider you select. Many competent Windows and open-source, Linux-based wikis exist, with the latter generally being more widespread. Most wikis are based on LAMP (Linux, Apache, MySQL, and PHP), as the majority of Web hosts support this option. For this reason, we'll focus on popular LAMP-based wikis. A wiki is a Web application that consists of a database, logic/application code, and the underlying server. In fact, on the backend, a wiki has the same components as a content management system like WordPress or Drupal. The main differences between a wiki and a standard website are built-in collaborative editing capabilities and page layout. To the average person, a wiki page will feel more informational. Wikis are designed to accommodate a large amount of text in a legible format that is easy to understand and bookmark. As far as website builders for wikis, any standard text editor can be used to edit the scripts that drive the wiki application's internals. A number of competent editors like TextEdit and Sublime Text can function as wiki site builders. Many tools come with wiki site builder tools to assist in customizing the wiki's look and feel. A plethora of free, PHP-based website builder wiki scripts are available for download, and many PHP enthusiasts have also developed their own. Building your own allows you to include custom features like chat and video file attachments, among others. For the slightly less technically savvy, however, plenty of wiki scripts are available pre-built and free of charge. 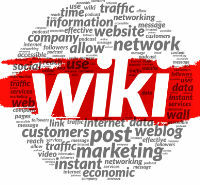 For example, DokuWiki is a popular LAMP-based wiki used for creating documentation and user guides within organizations. MediaWiki, the software that runs Wikipedia, is also LAMP-based and available to the general public. Finally, PmWiki is website builder-like Wiki application that makes pages that look and feel more like standard Web pages. Each page also has an edit button that allows for collaborative editing and modifications. Many job boards find PmWiki suitable for their particular needs. After deciding which open-source PHP wiki to use, the next step is to identify your Web hosting options. Fortunately, a staggering amount of LAMP-based hosting providers are available on the market with different price points and features. Opt for a Linux hosting provider; in virtually all cases, this means that Apache, MySQL, and PHP will come as standard, pre-installed server components. You'll need to decide how to size your requirements based on your expected traffic volume. If a considerable amount of traffic is expected, or if the wiki is for corporate/enterprise use, choose a Web host that supports high availability and more bandwidth. You can acquire a dedicated or virtual private server for better performance and improved security, as none of your server resources will be shared with other customers. For most users, however, standard shared hosting will suffice. Last but not least, be wary of special requirements that your wiki script may have on the hosting provider's server configurations. For example, some PHP scripts may require added libraries or settings to be adjusted. You may or may not have access to these configurations, or the hosting provider may not be willing to edit them for you. In these cases, be sure to select a PHP script with the least amount of PHP/LAMP configuration requirements.